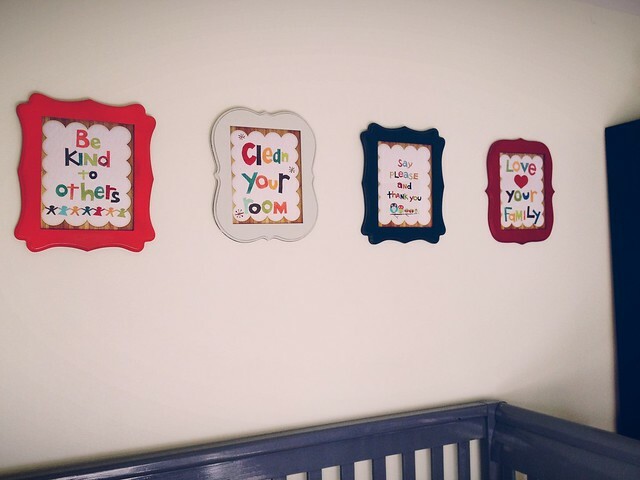 I have stewed for a long time over the blank walls in the boys' bedroom. I'm sure nobody minded their blankness but me. Still, I think my boys are affected by a purposeful space, even if they don't dwell on it the way their mother does. 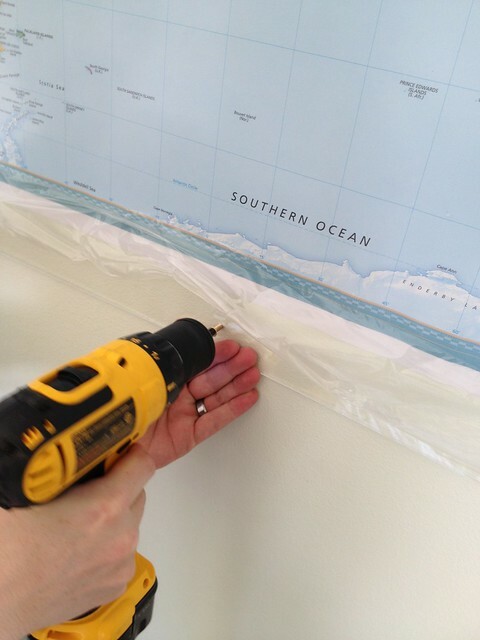 I decided a long time ago that I wanted to hang a big map on the biggest wall (vaulted ceilings make balance tricky). 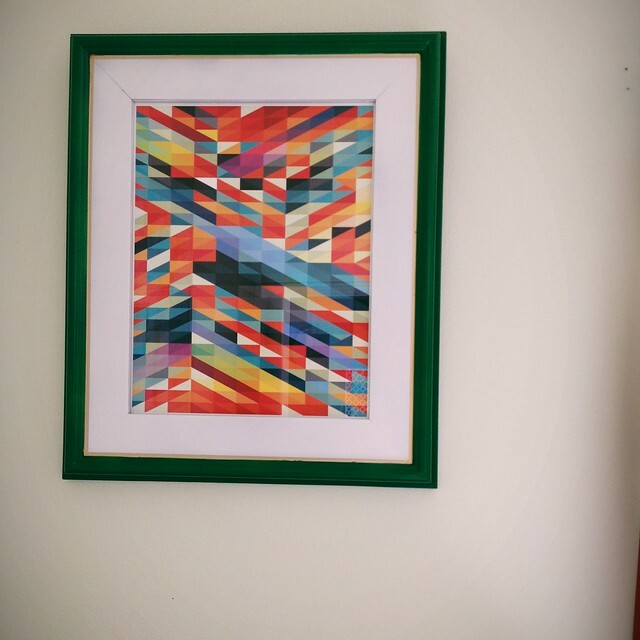 But I didn't want to spend a fortune framing a map that would surely be out-of-date before it even got hung. (And I did want it to be a current map, so it can be an educational tool and not just something filling the blank space.) 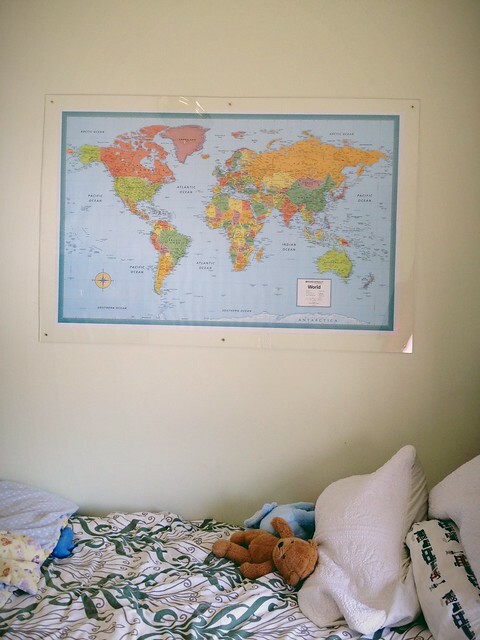 I found a 32 inch by 54 inch map at Walmart of all places, for around $5, but I needed a way to hang it and have it look purposeful, and hold up to my kids. I toyed with the idea of mounting it on foamboard, but in the end I needed something more durable, and I wanted to be able to switch the map out for a more updated one in the future. 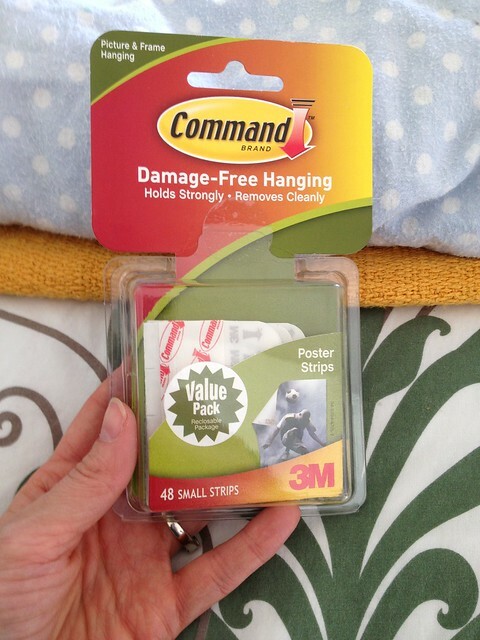 Anyone who knows me will not be surprised to learn I found my solution from Jenny Komenda's blog. I swear, the woman inspires me every time she posts. And so I took her Wallpaper panels in acrylic frames and adapted it for my map. 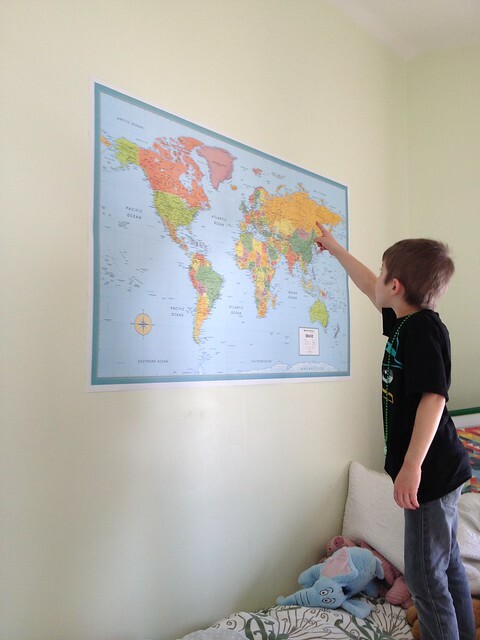 I hung the map on the wall using 3M Command poster strips. 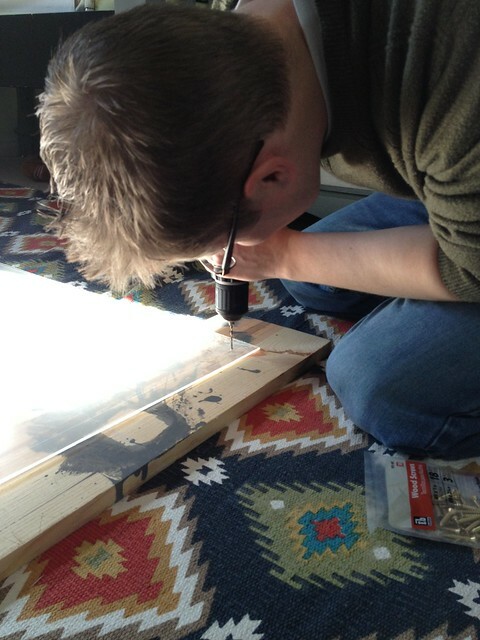 Laying the plexiglass on top of some scrap wood, we carefully drilled pilot holes in each corner, with an extra hole on each long edge, making 6 total. 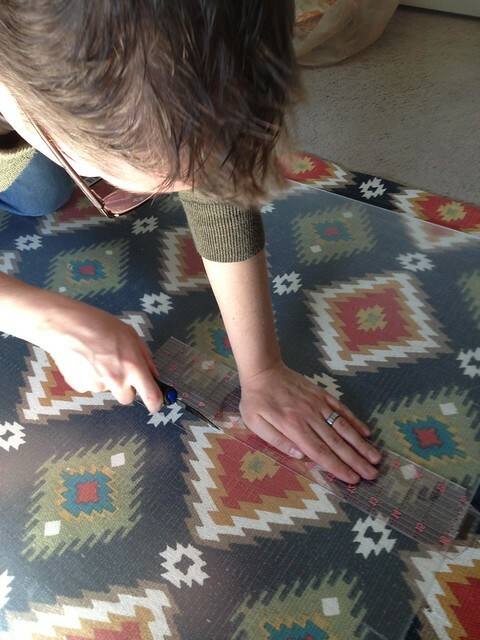 Then we removed the protective film from one side of the plexiglass and placed it against the map. We then screwed the plexiglass to the wall through the anchor holes, and lucky for us our top screws all went right into a stud so everthing was really stable. The plexiglass has a lot of flexibility to it though, and even though we had it anchored in 6 places, I think we could have used 2 more on the sides. It wants so badly to bow out from the wall. The boys went nuts over the map. They spent an hour pouring over it with Mr Renn the first night it was up. And now when we talk about their grandparents in Argentina they have a visual for where that is. And bonus, we can use a dry erase marker on the plexiglass if we ever want to temporarily mark up the map. I've also hung in their room the "Light" print that I got from Print Aid NYC and some "manners" prints I got from a Zulily sale. Ever so slowly the room is coming together. I still need to alter the curtains, give their bookshelf a facelift, and find new pillow shams and a new lamp. Pretty sure that list would give Mr Renn a heart attack. Slow and steady will be just fine. And having something on the walls makes a world of difference.